[German]Here is my Friday post with a short collective article about some of the issues surrounding the Microsoft July 2018 patchday. Microsoft has admitted the installation error 0x80092004 as known for the.NET-Framework Update KB4340558. Update KB4018385 has also been withdrawn. 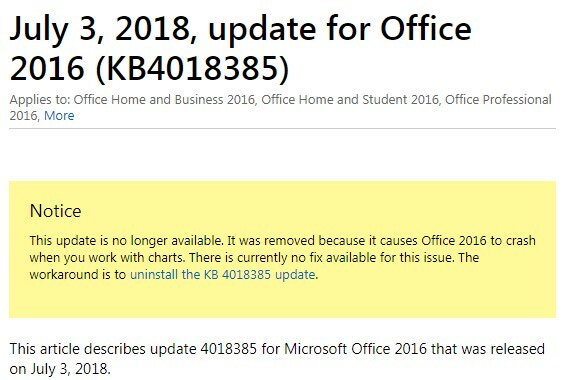 I’ve mentioned non-security update KB4018385 for Office 2016, released on Office patchday (1st Tuesday of the month) within my blog post Microsoft Office Patchday (July 3, 2018). Now Microsoft has pulled update KB4018385 for Microsoft Office 2016, the KB article shows the note visible within the screenshot above (thanks to the German blog reader for the hint). Addendum: The update has been pulled due to crashes of Office 2016 while using charts (see). Woody Leonhard has compiled the whole story with history at Computer World. Update KB44338818 (Monthly Quality Rollup for Windows 7 SP1 and Windows Server 2008 R2 SP1) dated July 10, 2018 brings several fixes, for instance for the Lazy Floating Point (FP) State Restore flaw (CVE-2018-3665) in Intel processors. I’ve wrote about that update within my blog post Patchday: Updates for Windows 7/8.1/Server July 10, 2018. German blog reader Michael Uray left this comment (thx), mentions serious issues with Microsoft Exchange Server 2010. The issue is discussed here at reddit.com for instance. I found also a thread at German heise.de site, where issues on Exchange Server 2010 caused by KB4338818 are reported. Microsoft has confirmed install issues with .NET Update KB4340558. I’ve covered the whole mess within my blog post .Net Framework: Update KB4340558 drops error 0x80092004?. German blog reader Michael Müller left a commen, mentions issues with update KB4135048 (Cumulative Update 1 for SQL Server 2016 SP2, which I didn’t address within my blog). I’ve got something else too. Should also not be installed. This kills the reporting service. after installing SP2 Cumulative Update (KB4135048) for SQL Server 2016, Reporting Services no longer work. – the server produces log files without content (0 KB), but very many of them (from Friday morning to Monday noon 17,000 pieces). Also this English MSDN forum post addresses the same error. Currently I receive the tip, not to install July 2018 patches (at least for Windows Server 2008 R2) due to ‘quality issues’. More will follow. This entry was posted in issue, Office, Update, Windows and tagged issues, KB4018385, KB4135048, KB4338818, KB4340558, Office 2016, Update, Windows. Bookmark the permalink.